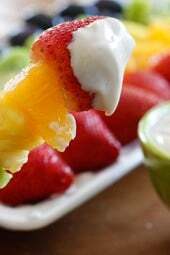 Rainbow Fruit Skewers with Yogurt Fruit Dip – A healthy snack or dessert for kids and adults alike! More quick and fun summer fruit snacks I love are Frozen Fruit Pops, Angel Foods Cake and Fruit Skewers with Cheesecake Dip, Fruit Pizza and Tropical Fruit Salad. Who doesn’t like rainbows, they have a way of bringing out my inner child and making me smile. The pot at the end of this rainbow is quite a treasure, a simple dip made from Greek yogurt and honey, yum! 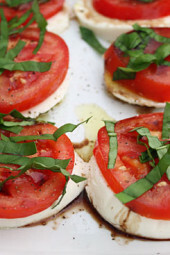 Serve them at parties, picnics, breakfast or as an after dinner treat. Use whatever fruit is in season anytime of the year! 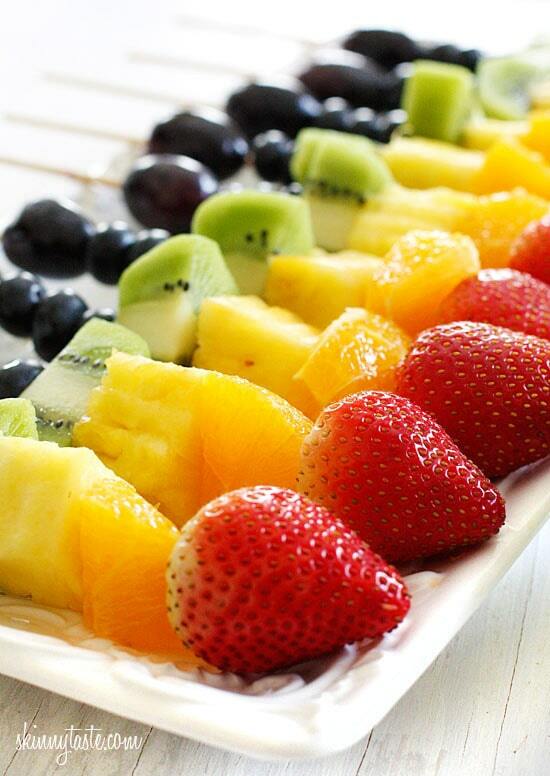 Cut up your favorite fruit in even squares and place them on skewers in rainbow color order. Create the dip by combining the yogurt and honey and serve along the side of the fruit. I love a rainbow theme! I made these for my sons preschool snack! So pretty! I used coffe straws instead of skewers…wouldn't want any missing eyes! Love how easy this is and super healthy too! I like a simple dip made from plain yogurt, fresh lemon juice and honey. Have you ever tried this? Really good! Another good idea with the dip if you want a different flavor is to mix in sugar free, fat free jello mix into the yogurt. I used vanilla cheesecake flavor and it was amazing!! They look so yummy! Totally putting me in the mood for summer too. These rainbow fruit skewers with yogurt fruit dip look wonderful. Let Spring and Summer begin! 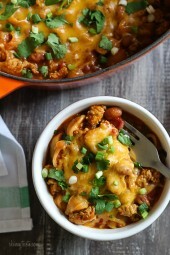 These look awesome, can't wait to try this recipe! 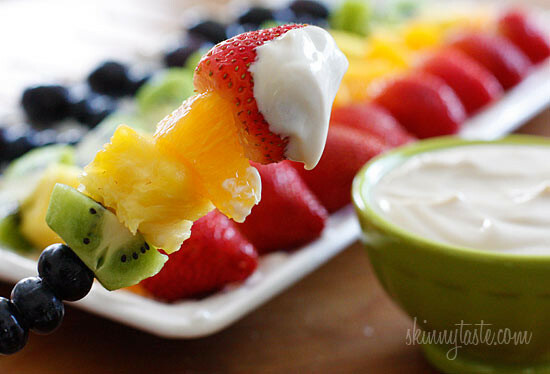 Love the yogurt dip you paired with these fruit skewers! Brilliant idea, and so colorful and delicious. Duh, so easy, but I never think of these things! Now I want to host a cookout and serve these. Did you use plain or vanilla yogurt? I have made these for my kids before and they just adore them – rainbows + food on a stick just delight kids! It looks lovely on a brunch table, too! Love your website! These looks great and I am going to make them for my daughters 1st Birthday. So far, your recipes have helped me lose 35 pounds. Just made a hybrid of your eggplant parm and lasagna roll-ups last night. What site do you use to figure out the calories, fat and carbs of each of your meals? I just want to jump into the page – this looks AMAZING – so great. Will try with the kiddies. I love that dip, I make it all the time. I also like to dip cinnamon and sugar pita chips in it! Yum!! Even as an adult I admire this snack recipe. I used to make a different version when I was in Dakota. Its quick to prepare and you dont need so much processing with ingredients. Thanks for a great snack/side dish to try with my little one! She loves fruit and yogurt! great and simple idea! I never have any problem getting my kids to eat fruits but this rainbow platter is just so colorful I'm sure they'd love that, and they'd love making it with me too! First time on your blog – absolutely loving it! These skewers are so simple, but so perfect for a light dessert. What a fantastically simple dip idea! Only 2 WW pts? Sold! I'm new to your site, but I have already found so many recipes to try! 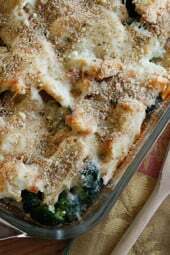 I've tried a lot of recipes on this site and am seldom disappointed. Everything seems to have a lot of flavor and is just as good as it looks! These look amazing! So simple, yet so beautiful. And healthy. And yummy. And all around just awesome! I love this rainbow idea! Another great mix-in for vanilla yogurt to use as a fruit dip is creamy peanut butter. About 2 teaspoons for every cup of yogurt. It's especially good to use for dipping bananas & apples. Yum! wow these look beautiful!!!!! Great Idea! Think I will be making these for easter so I have something healthy to munch on!!!! I'm going to make this for Easter so I'm not tempted to shovel an extra Cadbury egg into my mouth! This looks so delicious! I love mixing a little bit of honey with greek yogurt to dip apples into. Next get together I have, I am making these gorgeous healthy treats. I make this "dip" all of the time. Orange Blossom honey is my favorite and gives it such a fruity taste. Would you suggest plain greek yogurt or vanilla?